Mike Feeder of Assured Home Inspections conducts inspections throughout the area. Today’s home inspectors have access to an array of technological assistants: thermal imaging cameras, radon cans, gas detectors and computer software to help put their findings into an illustrated report. 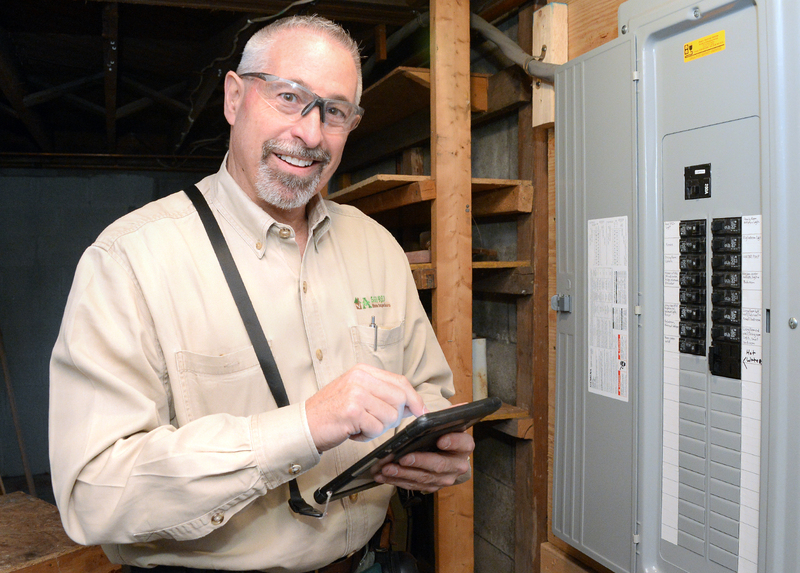 However, “the two things I use most are a flashlight and a screwdriver,” said Mike Feeder of Assured Home Inspections in Hudson Falls. Feeder does inspections in Saratoga County and the North Country. He works out of his home. “I have a home in my office,” said Jolene Lomnes of Informative Home Inspections in South Glens Falls. She meets clients at the inspection site and will travel anywhere within 100 miles or so of the home base. Feeder said he recently did an inspection in Missouri. Typically, home inspectors have a background in construction. They are licensed by the state following a training course and are required to take 12 hours of continuing education a year. They must renew their licenses every two years. An issue of growing importance is mold or, as the inspectors are required to term it, “mold-like biogrowth” or a “mold-like substance.” Only a licensed mold inspector can say for sure whether it is really mold. Larry McGann of Spire Inspections in Ballston spa compared himself to a family doctor. “If I see symptoms of something, I refer the client to a contractor,” he said. “Millenials are very afraid of it,” McGann said of the mold issue. “It’s everywhere,” said Chris Sorell of MLS-Saratoga Home Inspections, especially in attics and basements. “Mold can be very dangerous,” Feeder said. Black mold can “literally turn wood to mush.” Some molds can be toxic to humans and animals. An inspector who detects a mold-like substance will encourage calling in a licensed mold inspector. Sorell is a mold inspector, but most home inspectors are not. A mold assessor can test and identify the substance, suggest a remediation plan, and estimate the cost, Sorell said. Then, a licensed mold remediator comes in to fix things up, typically applying a biocide that will kill the mold and leave a residue to prevent it from regrowing. After that, the mold assessor returns to certify that the job was done right. The entire process can cost from $1,200 to $3,600, Feeder estimated. The difference in cost is significant. Feeder said any defect that will cost $1,500 or more to fix is considered a major defect and it is the responsibility of the seller to repair it. Under $1,500, it is the buyer’s responsibility. Radon is another issue. It is a naturally occurring radioactive gas sometimes found in basements. It cannot be seen or smelled. It is a leading cause of lung cancer among non-smokers. To detect radon, Sorell leaves a “radon can” filled with charcoal for 48 hours and then checks the results. Some larger companies have machines to do the detection. As with mold, the cure for radon can be expensive. It usually involves getting below the basement floor to install piping and a fan. There are individual areas that can involve specific problems. For example, for waterfront property in Queensbury, state law now requires inspection of wells and septic systems. When a house is sold, it must be certified not to pollute the ground or water, Feeder said. If there is pollution, it can be costly to fix, anywhere from $3,500 to $35,000, he estimated. Most home inspections, however, are checking more mundane things: Does the roof leak? Do the heating and air conditioning work? Is the wiring safe? What about the plumbing? Is the building structurally sound? Are there signs of wood-destroying insects? Water intrusion is the most common problem, according to Lomnes. In older homes, McGann said he also looks for lead paint, asbestos, and buried oil tanks. Some inspectors have come to rely on thermal imaging cameras to see what is going on inside the walls. McGann dismissed the technology because it requires too much expensive equipment and training. Lomnes said thermal imaging “is certainly helpful but it has its limitations. It is something I am learning to use,” she said. Lomnes attaches the lens to her smart phone and takes infrared photographs. It allows her to detect hot or cold spots in the wall. A cold spot may indicate water. Most home inspections are ordered by prospective home buyers. Sometimes, a prospective seller will ask for an inspection. Lomnes recommends periodic inspections, perhaps every five years, especially after major repairs. “Houses change like children grow,” Feeder commented. In general, an inspection takes an hour or two and cost $500 or less. Inspectors like their clients to be present at the inspection. All of them prepare written reports of their findings. “Home inspections are an important part of the home buying process,” Lomnes said. She noted that some buyers forego an inspection in the hope that it will make their offer more attractive to the seller. But there are many potential hazards with that strategy. “Real estate is a ‘buyer beware’ situation,” Lomnes warned. The situation can be further confused when inspectors rely upon real estate agents to refer clients to them. They don’t want to kill a sale and lose further referrals. “I want to work for my client, not the Realtor,” she said.